Take your home from drab to fab when you purchase the vinyl flooring from our local store. No matter what look you are looking for, we help you find a complete collection at a price that fits any budget. When you are ready to install or replace your current floors, we show you why replacing outdated materials with new and improved vinyl tile flooring doesn’t have to be a challenge. We make the replacement process easy by providing impressive selections and professional services. The latest vinyl products we offer perfectly mimic high-end flooring fashions at cost-effective rates. Choose from among our stunning collections of vinyl tile and vinyl plank flooring options. As one of the most popular material options among homeowners, vinyl tile flooring offers an eye-catching look at an affordable price. Designed to look and feel like your favorite tile materials, this flooring is a great choice for any room of your home. This material can easily be used to recreate the styles of other flooring products. From the classic design of hardwood to the modern look of stone, vinyl tile floors can bring both style and function to any area or room in your home. When you have children or pets, you already know the importance of choosing a durable flooring material. Vinyl tile floors are easy to maintain, and can be cared for with nothing more than a mop and broom. Are you looking for something durable, practical, and affordable? Today, one of the leading options for homeowners is vinyl sheet flooring. This affordable material is easy to install, stands up to moisture, and is guaranteed to look beautiful for years to come. No matter what style you prefer, our knowledgeable sales team is happy to help you make the selection process easy. 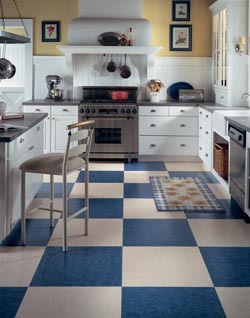 We feature a complete collection of vinyl sheet flooring in a range of colors, patterns, and styles. Turn your home into your castle and show off the luxurious design of hardwood in every room. This flooring is made to stand up against regular wear and tear. Plus, the unique design of this durable and beautiful material perfectly mimics traditional hardwood floors. Whether your home features a modern or traditional style, there is a flooring pattern available for you. Available in varying stains, grains, finishes, and species, vinyl plank flooring is able to satisfy even the choosiest of homeowners. Once you have found the perfect flooring materials for your space, complete the process by turning to our professionals for your installation. For your convenience, we offer a full vinyl flooring installation in any room of your home or business. From kitchens to bathrooms, our experienced and trained technicians complete jobs in spaces of any size. We work hard and are able to accommodate your busy schedule to ensure a limited interruption to your daily routine. While many homeowners prefer to do projects on their own, a vinyl flooring installation is one job best left to the professionals. Our trained technicians focus on the details so that you can enjoy your new flooring. To guarantee your new kitchen vinyl tile or bathroom vinyl tile continues to look great far into the future, entrust the installation process to our team. Every luxury vinyl flooring installation that we perform is handled by trained technicians. Our work is done right the first time, and each job is then backed by industry-leading guarantees or warranties. Why shop with us for vinyl flooring? As any homeowner knows, all it takes is one accident or spill to ruin the look of your floors. Do you need floors that hold up under the activity of your family, friends, and pets? No matter what your lifestyle is like, this flooring can offer you the durability and lasting power that you need. Our friendly and knowledgeable team of associates is here to help you make your decision easier. We work with you and consider your personal needs and tastes in order to provide helpful flooring recommendations. Contact us to discover the benefits behind installing vinyl flooring. We proudly offer a full line of vinyl tile flooring and other products for customers throughout Springfield, Junction City, Harrisburg, Albany, and Eugene, Oregon.